Berge & Meer offers high quality travels for adventurous clients. From the end of December 2017 until the end of January 2018, Berge & Meer launched a TV campaign with as a major target the 50-59 year-olds. The campaign advertised several travel destinations and experiences on a large mix of public, private and pay TV channels. During the following February, a sponsoring campaign was surrounding a travel TV program with additional classic TV-Spots around the transmission. Berge & Meer was looking for a partner who would be able to give them clear insights on the performance of the TV spots and the impact of the different creatives on their website. Based on those results, the client wanted to be able to optimize their future campaign and media plans. How many, but especially which website visitors are visiting the website following the airing of the TV spot? What is the detailed Customer Journey of those visitors? Which investments are generating which revenue? More than measuring and analyzing the TV impact and performance of their campaign, the client was also interested in synchronizing their TV strategy with their online channels. Therefore, they chose Digital Follow-Up to increase the conversion rate and revenue through focused retargeting of the TV-engaged visitors who reacted to a given TV spot - via our partner Criteo. With Ad Performance advertisers can measure the impact of their TV spots on their websites and applications in real time. The real time spot detection detects a spot, as soon as it is airing. During the then opening analysis window, all reactive website visitors are registered. With the Realytics Baseline we can differentiate between natural traffic and the traffic coming straight from TV. The client can follow the analysis in our portal and monitor the personalized KPIs he has chosen before the campaign starts. 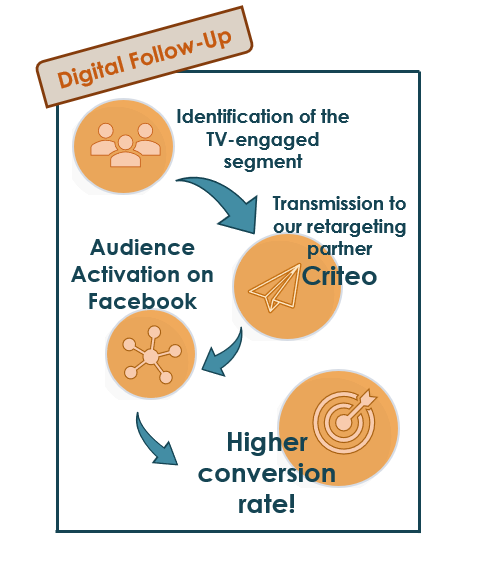 Digital Follow-Up allows advertisers to retarget the group of TV viewers, that have visited the website following a spot airing (or opened/downloaded an app) online. Realytics offers several retargeting scenarios (e.g. audience activation on Facebook) to touch the reactive segment online. This way, it is possible to increase the click and conversion rate. Due to the real time access to the campaign performance in the portal, the client has the possibility to analyze and compare the impact and performance of specific spot creatives, channels, weekdays or dayparts. Adapted reports and workshops for the utilization of the dashboard are helping with the right interpretation of the data. The different creatives, channels and time periods are especially compared regarding the customer journey, the visits and actual orders. On the Berge & Meer website a clear order process helps the client to follow the journey easily: From the first visit on the website, trough the search for the right travel destination and offer to the different booking steps and finally the conversion. The global effect of the TV campaign on the website will be measured on top of the direct effect. Since the products were a higher priced “investment” with a resulting longer decision making, the client behavior could also be observed weeks after the first contact. The preparation of an adapted, independent reporting and joint discussion of the results insures that he client can draw as many useful learnings from the partnership as possible. Berge & Meer obtained a higher click and engagement rate due to a retargeting of a TV segment on Facebook. The data basis and easily applicable learnings & recommendations for actions are useful for the planning of future TV campaigns. The adjustment of the cross-media strategy will be a reasonable objective to further increase the effect of TV and the conversion rate.